This photo is now a final contender for the 2011 Photo of the Year. Go to Derbylife.com and vote for #3 by Adrian Valenzuela by January 25th. 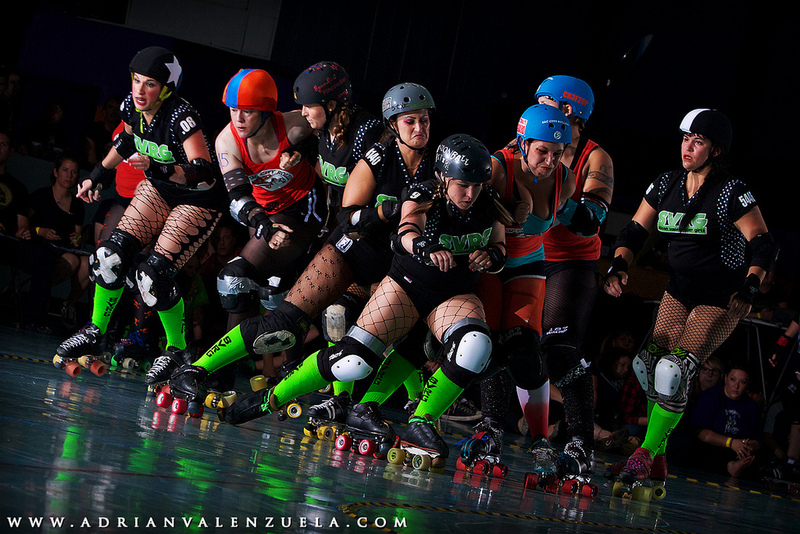 Derbylife.com has also featured league photographer Donalee Eiri’s fantastic Derbyverse gallery. Imagine a world where roller derby athletes peer down at you from billboards and grace the walls of art galleries...that’s Derbyverse! Go gaga over Donalee’s derby gallery, arrange a shoot, or purchase a photo over at Photography by D.E.sign’s website. Be sure to show Donalee some derby love at our next bout! If you'd like another volunteer photog this season, I'm available! hey, there's a rumor going around the internet that you're playing Santa Cruz in March (I'll be there!). Hey, Nocklebeast! Rumors are true. Glad you'll be joining us for our season opener on March 24th to photograph some double-header action! Hi Will J.! Send an email to volunteer@svrollergirls.com for details on shooting our bouts.